Heightens contrast. 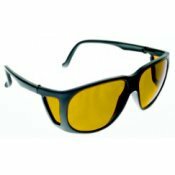 Provides maximum brightness and good visual acuity. Glare Control. Suggested for Night Blindness, pre-cataract, Glaucoma, Sun/Ski sports, and Macular Degeneration. SpectraShield style shown on NOIR UV Shields Menu Page.